Today I have for you the next fabulous edition of my Pinup Fit Series! Rather than sharing my own workout today I’m trying our an actual workout I found in the 1950’s copy of a Woman’s Weekly magazine I was reading. I demonstrate each exercise and give my feedback. I hope you’ve enjoyed today’s video and maybe had fun working out with me! If you’d like to see more Pinup Fit videos be sure to let me know in the comments below! Subscribe to never miss one of my glamorous videos, they come out every Thursday and Saturday, 8am (GMT+8)! 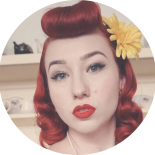 This entry was posted on February 16, 2019 by Miss Lady Lace in health, pinup fit, Videos, YouTube and tagged 1940's, 1950's, miss lady lace, perth, perth pinup, perth pinup blog, pin up, pinup, pinup blog, pinup blogger, pinup fashion, pinup fitness, pinup girl, pinup life, pinup lifestyle, red lips, retro blog, vintage, vintage blog, vintage blogger, vintage perth, vintage pinup blog.